A tea garden is a type of Japanese garden that surrounds, or forms an entrance to, a tea house, where the time honored ritual of the tea ceremony, cha no yu takes place. The experience of the ceremony is intended to be both aesthetic and spiritual, engaging the senses and calming the soul. 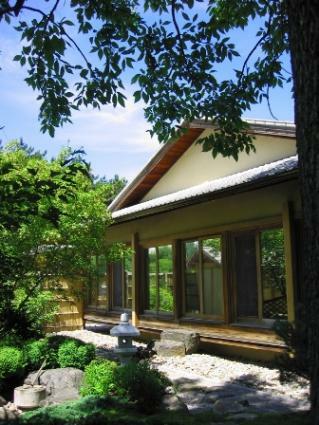 The garden developed as a way to transition from the busy outside world to the tranquility of the teahouse. Visitors pass by refreshing greenery, pause at a reflective basin of still water, and walk the slow, measured pace of the cha niwa, or dewy path. The tea ceremony originated in Song Dynasty China and was brought to Japan by Zen monks in the late 12th century. The rules governing the practice were codified in the 15th century by a monk named Murate Juko. A separate space for this event was created; the teahouse built by the Silver Pavilion became the standard for teahouses and gardens built later. The floor was 4 1/2 tatami mats in size; it had a thatched roof and smooth mud walls. Sen no Rikyu, tea master to a powerful shogun, Hideyoshi, further refined the ceremony and its precise movements. Central to the understanding of Japanese sensibilities, the principle of sabi, or 'aged and mellow' is expressed in the ceremony, the objects displayed in the teahouse and the materials and composition of the garden. The principle of wabi, 'rustic, yet refined' was meant to be invoked as well. These ideas come through in the architecture of the teahouse, gate and fence, which are derived from traditional country farmyards. Vernacular forms and the use of natural materials such as smooth river stones, bamboo and wattle and daub walls further emphasize the simple, earthy aesthetic. After passing through the garden, visitors would remove their shoes and bend to pass through the low door of the teahouse. One small, high window lets in light, but does not allow a view of the garden, so that all attention is focused on the tea making and the few objects in the room. A scroll painting and or a simple flower arrangement would be admired. These would change to reflect the seasons. The tone of the tea ceremony experience was invoked through the use of these garden elements, which can be adapted for use in contemporary gardens. Before entering the garden, visitors catch a glimpse of green through the open lattice of a bamboo gate. Tea gardens are often surrounded by a slender bamboo fence. Near the entrance a stone basin with a dipper is placed, so guests can wash their hands and take a drink. The emphasis in a Japanese garden, is on the ground plane. Flat stepping stones are surrounded with moss or low ground cover plants. Usually the stones are smooth river stones with rounded edges. The plantings are there to promote a calming experience as visitors pass by, they are never showy flowering plants, but a harmonious palette of greens and subtle texture changes. Stone lanterns, of the type found in temples were adapted to light the path for nighttime ceremonies. Like the other objects in the teahouse and garden, they became a focal point that embodied the aesthetic ideals of the developers of the culture of the tea ceremony, and different styles evolved. The aesthetics, ideals, and elements of the tea garden have been very influential in garden design. Eventually in Japan, the tea garden became more ornamented and lost some of its simplicity. In the 17th century, tea became widely popular in England and with it the tea garden. British, Europeans, and later Americans created their own versions of the teahouse and garden. In the 1930s, Japanese garden designer Shigemori Mirei reinvented the traditional garden, using elements such as a patterned ground plane, moss and trimmed hedges in new ways. His most famous work, The Abbot's Garden in Kyoto, uses cut stones and moss is a checkerboard pattern. The idea of creating a small space to appreciate natural beauty up close, away from the chaos of every day life, is as relevant today as it was to monks and warriors centuries ago. The elements above and the principles of wabi and sabi can guide you in incorporating an Asian motif, or simply a sense of serenity into your garden.